Modern ideas get tangledup with traditional ones in the latest intriguing installment in the beloved, best-selling No. 1 Ladies' Detective Agency series. Precious Ramotswe has taken on two puzzling cases. First she is approached by the lawyer Mma Sheba, who is the executor of a deceased farmer's estate. Mma Sheba has a feeling that the young man who has stepped forward may be falsely impersonating the farmer's nephew in order to claim his inheritance. Mma Ramotswe agrees to visit the farm and find out what she can about the self-professed nephew. 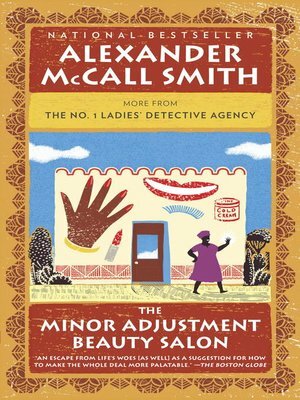 Then the proprietor of the Minor Adjustment Beauty Salon comes to Mma Ramotswe for advice. The opening of her new salon has been shadowed by misfortune. Not only has she received a bad omen in the mail, but rumors are swirling that the salon is using dangerous products that burn people's skin. Could someone be trying to put the salon out of business? Meanwhile, at the office, Mma Ramotswe has noticed something different about Grace Makutsi lately. Though Mma Makutsi has mentioned nothing, it has become clear that she is pregnant . . . But in Botswana--a land where family has always been held above all else--this may be cause for controversy as well as celebration.